These days when building a website, I always use custom menus in WordPress to order my pages and to add a category(ies) to my navigation bar. You can do this by going to the main navigation menu APPEARANCE -> MENUS. Note: The availability of this option is dependent on the theme you are using. After going to the APPEARANCE -> MENUS screen, click on the link for Screen Options in the top right of your screen. In the dropdown there, below the usual Show on screen checkboxes, is another line of Show advanced menu properties checkboxes. Click the box for Link Target to add a checkmark. 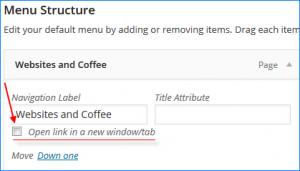 Now all your Menu Items will have the additional option of opening the link in a new window/tab.